Please log in to rate alexh303's reputation. Prevent Begs for reputation, negative reps you back if you neg rep him, toxic user. socialism Begs for reputation, negative reps you back if you neg rep him, toxic user. nod Begs for reputation, negative reps you back if you neg rep him, toxic user. Crazy Begs for rep, toxic, and a liar. Jigglypuff Begs for reputation, negative reps you back if you neg rep him, toxic user. TehSharko If you have to scam on a lid-based website, you actually have no life and then you attempt to get away with it by moving your items to another account. Brick-hill staff can easily see trade transactions from your account, why even bother? 2wo You know wh- HE'S A SCAMMER! 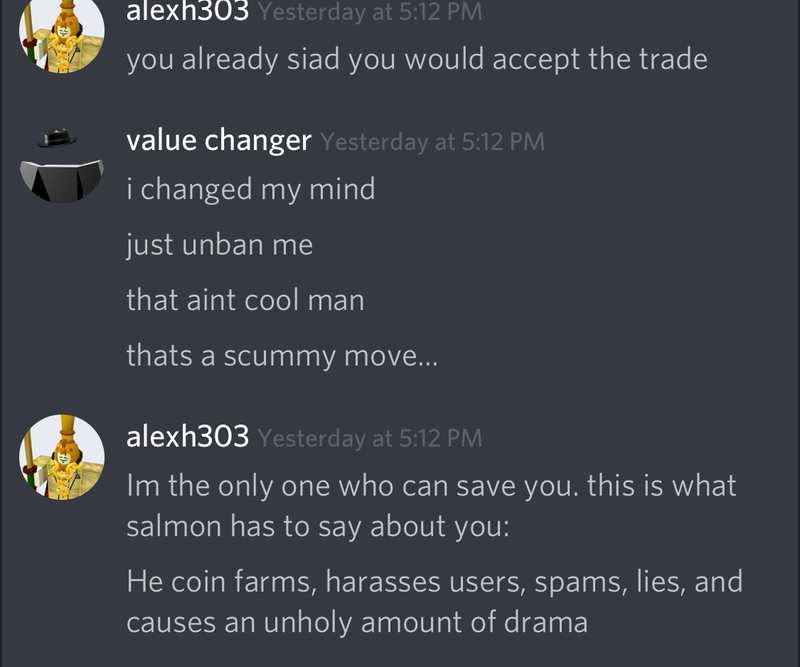 Falsely claimed to another user that he could get him unbanned, in return for items.